"The network is the computer." - John Gage, Sun Microsystems. My Network is going to be the backbone of everything including the Cluster I am building. IP phones, IPTV, Data storage, Remote processing, Printers, Remote controlled audio speakers, IP security cameras, Home automation, IP enable devices. 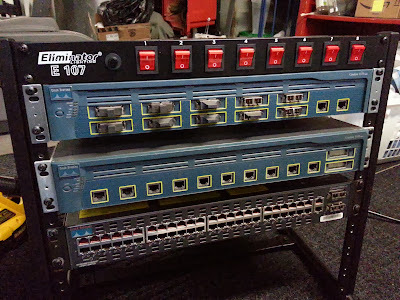 This mini rack is for the server rack in the office. These switches have been modified to be quieter. I did that project HERE. These have a SC fiber connection with 50~62.5/125 fiber. To have these uplink ports work with wired gigabit ethernet (1000Base-T) you will need a Multimode fiber converter. Like this. This firmware allows SSH and web enabled status along with all the ipservices (EMI) version has to offer. Since these switches are very very noisy with the blowers. I did this modification. These also have a Cisco RPS 675 Redundant power supply. I was looking at upgrading my routers to Cisco 3845. These are perfect for anything in the foreseeable future. (Minus Google fiber. Which is gigabit and I have no idea what to use for that.) The major problem is power consumption. These routers use ~430w of power... thats just crazy and unaffordable. Wall outlets are double gang, old work, low voltage bracket. Wall plates are 12 port keystone. Proposed panel standard. More likely most panels with have 4-6 Cat6 runs. Acquired a massive UPS that will greatly improve this project. This also frees up the possibility of it being in the rack. With the design of the racks to have intake air filters this will make it possible to house the servers I was once planning to install upstairs. Since this will be the closest to being a nightmare of wiring, planning and labeling will be everything. I realized I have made a mistake. Nothing that can't be corrected. Earlier I thought I had the right fiber optics. In actuality the best to use for future proofing for in-building cabling is still multimode. This has more to do with the equipment than theory of operation (Theory says single-mode is better). For future proofing and cost. OM3 50/125u cable with LC connectors seems to be the standard moving forward. This will allow 100Gb future use. You cannot mix 62.5 to 50u cabling because of mismatch. So the patch cables I have are only for current use and need to be replaced later. Working on V.07 of the rack as it might not have enough space for future ports. Rearranging for 3' cabling for cost reduction in patch cords. If that isn't possible then I might just end up making my own cables. Finished my fan modifications on all the switches. Now I notice a high pitch whine out of the 12T. Will take it apart tomorrow and swap power supplies to see if its from a bad coil. If that doesn't fix it I guess I'll have to deal with it. Switch has been reflashed and is up and running. Turns out the flash had an error deleting a file. So I formatted the flash and reinstalled the image. The installed claimed it failed, yet when I booted it in the console, no errors occurred and is running perfectly... so who knows. I'm thinking the previous image was corrupt. The 3550-48 is giving me non stop headaches. Can't get it to load into express setup. Can't erase old software image. Gave up, formatting flash and going to have to learn the hard way of how to load a dead switch from the console. Fortunately for me Cisco provides everything I need to know on their website. I also learned that the upgrade path for my network if I so wanted to move up from the 3550 series would be the 3750 series. Right now I just have no need for anything better. But its good to know what I will need in the future if there needs to be upgrades. Finish design of rack organization. This needed to be able to handle everything today as well as anything in the future. planned spaces for anything that can be imagined actually was a bit more complicated than I originally thought. This layout will allow all patch panels for today and future connectors including more jacks and fiber for the "internet of things" along with a house built around the network like networked TV and phone. The thought of having about ~4 ports per room with ability to pull 8-16 more. ~2 boxes per room, each box is a double gang with 6 keystones per gang. In the Primary wiring will only be 2 cat6 lines per box with easy access to 10 more ports. After reading most of the manual for these switches. I finally found how configure link aggregation to form a dual gigabit link from each switch to the master backbone switch. I used LACP as it is the newest protocol and will be used later when I add a LACP via a multiport NIC on my future server and workstations. Then I figured how to connect the switches together. All of them for the uplink ports use GBIC modules. I used ws-5484 modules PN# 30-0759-02 1000BASE-SX. I used these because media converters like a fiber-copper converters will also use the 62.5/125 multimode fiber along with the same 1050nm laser. These modules have Duplex SC connectors. Upon looking for how to install wall plates and patch panels for in home permanent wiring. Newer stuff now uses LC type connectors. They also make SC-LC patch cables with matching 62.5/125 fiber. This will work perfectly as these duplex LC connectors fit on one Keystone that can be fitted in any patch panel or wall plate.